The Birmingham Public Library Young Professionals (BPLYP) and LIFE Ministries are donating 15 tickets to the October 1 2016 Eat Drink Read Write festival kickoff event featuring Chef Bryant Terry to youth affiliated with the West End Community Gardens. The BPLYP will be donating 10 tickets (valued at $200) and LIFE Ministries will donate five tickets (a value of $100) to youth who help grow vegetables and other food at the West End Community Garden. Tickets to An Evening with Chef Bryant Terry, taking place from 6:00-8:00 p.m. October 1 at the Central Library, are available at https://byrant_terry.eventbrite.com. Chef Bryant Terry of Oakland, California, has built a national reputation as a vegan chef and food activist. During Saturday’s event, he will share his story and discuss his passion for creating a healthy, just, and sustainable food system. A 2015 James Beard Foundation Leadership Award-winning chef, Terry is Chef-in-Residence at the Museum of the African Diaspora in San Francisco. Bryant’s fourth book, Afro Vegan, published by Ten Speed Press/Random House in April 2014, was named by Amazon.com as one of the best cookbooks for 2014. Read more about Bryant at his website, www.bryant-terry.com. LIFE Ministries is led by Senior Pastor Christopher Stoutermire. Though his church is based in Shelby County, Stoutermire previously worked with youth in Birmingham through the Boy Scouts and other agencies. His wife serves on the board of the BPLYP, and he felt that supporting the West End Community Garden was a worthy cause. “I believe in giving back, and felt this would be a great way for us to help youth in the inner-city,” Stoutermire said. This isn’t my regular movie blog article where I talk about the films I see over and over again. 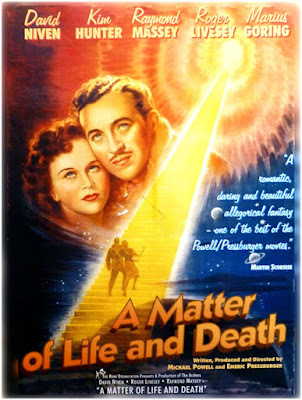 A Matter of Life And Death is fairly new to me (although I spent many years tracking it down) and I’ve only seen it once. 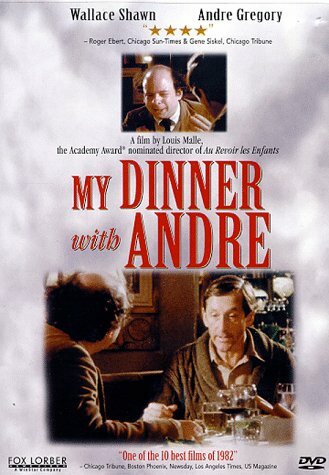 My Dinner With Andre, however, reverts to type: I’ve seen it at least ten times. I’ve read the screenplay three times and would absolutely like to sink my teeth into the thousand pages or so uncut transcript that Wallace Shawn started with before he whittled it down to the Dinner script. I have a whole manila file of Dinner-related clippings at home. I’ll be seeing this movie again and again for the rest of my life. I gladly own my obsession. Like seemingly everything Andre Gregory is prominently associated with, Dinner divided the critics when it was released. On the rapturous/damning divide, I fit into the former when I first saw it, two years after it came out. Stunned, mesmerized, exultant—it’s safe to say that this movie made an impression on me almost no movie has ever made. Virtually the entire movie is two men talking, Wallace Shawn and Andre Gregory, who play, respectively, Wallace Shawn and Andre Gregory. And yet don’t play them. I took it for a sort-of documentary on that initial, exultant viewing. But it’s not as simple as that. You see, Shawn and Gregory play themselves. They play characters that share their names and resemble their real-life selves (Somewhat? Fairly? Largely?) but aren’t quite them. This creates dramatic distance, tension, blurring, guessing-games. All this might seem to confuse the dramatic impact but it actually heighten it. The entire movie works, and works very well indeed. So the two men talk. For about 107 minutes. During pre-production, The Powers That Be insisted that there be flashbacks, no audience will stand for this, it’ll get monotonous, flashbacks break up the intensity, what—do you wanna wreck us? But Andre and Wally stuck to their guns, got Malle on board and it succeeds without flashbacks. The resulting intensity works for the movie, not against it. Because the two leads are so skilled at getting you to imagine the stories in your mind, the movie is far richer than it would be had flashbacks been inserted. It’s the oldest drama of all-storytelling. The conversation is so stimulating, so white-hot, you don’t notice the passing of time, and the movie seems to almost zip by. Andre’s para-theatrical and para-religious quests in the Sahara, the Polish forest, Findhorn, and Long Island are contrasted to Wally’s rooted life paying bills, ticking off his errands as he completes them, trying not to obsess about money. It’s a film about the benefits of risking the Don Quixote life as compared to admitting the Sancho Panza demands of practicality. Perhaps most importantly, it’s about the need to wake up and to find a more genuine way of living. Shocking at times, very funny at others, it reveals new facets, new angles, and new insights just when you think it can’t do that anymore, say on the ninth viewing. A conversation of this length has never, to my knowledge, been done in the movies before or since Dinner, and it probably shouldn’t be. I doubt anybody else could avoid the pitfalls Andre and Wally dodged.
. 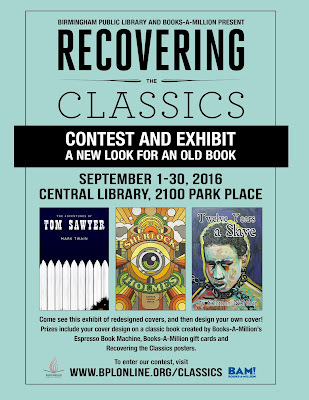 The deadline to enter the Birmingham Public Library (BPL)’s Recovering the Classics contest Friday, September 30, 2016. BPL has partnered with Books-A-Million to host the contest, which allows Alabama artists of all ages to design a cover for a classic book. Prizes include your cover design on a classic book created by Books-A-Million’s Espresso Book Machine, Books-A-Million gift cards, and Recovering the Classics posters. To enter the contest, visit www.bplonline.org/classics. The winners will be announced by October 15, 2016 the week of October 17. 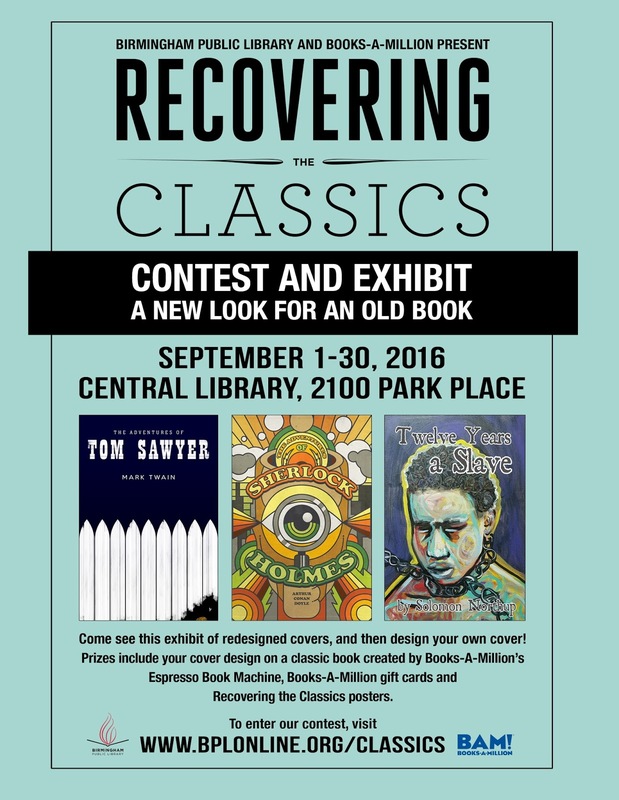 The Central Library has been hosting the main exhibit of Recovering the Classics posters on its first floor since September 1, 2016, and the exhibit concludes on September 30, 2016. Several other BPL branches will have smaller exhibits. Recovering the Classics is a crowdsourced collection of original covers for classic books in the public domain created by illustrators, typographers, and designers of all stripes. Its partners include the Creative Action Network, Harvard Book Store, Plympton's DailyLit, the White House, the New York Public Library, and the Digital Public Library of America. The goal is to bring an exhibit of redesigned cover posters to each of the 50 states, and BPL is representing the state of Alabama. "Don't judge a book by its cover" is a saying to evaluate something on its contents rather than its outward appearance. However, many people often judge a book by its cover to determine if it is worth reading, and many of greatest classics still wear poorly designed or auto-generated covers that fail to capture what makes these books exciting and inspiring. Twenty entries have been submitted as of Wednesday, September 28, Gentry said. The classic book cover contest was selected in August as one of the winners of the BPL Board of Trustees Innovative Cool awards. You can find out more about Recovering the Classics at www.recoveringtheclassics.com. Do you know what your rights are if you were pulled over by the police? Are you aware that certain moves by drivers can make police officers fearful, thus putting your life and others in the car in danger? The Birmingham Public Library is hosting a free workshop featuring legal experts who will answer questions on how to react and interact with law enforcement. 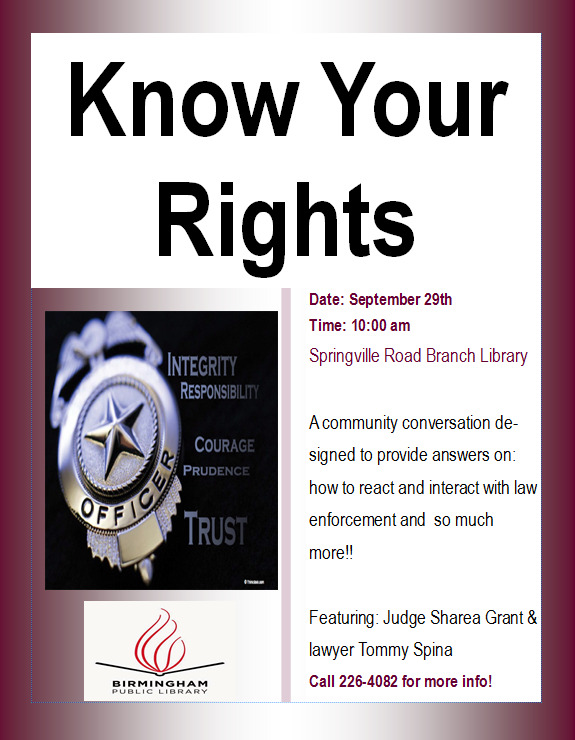 The Know Your Rights workshop will take place on Thursday, September 29, 10:00 a.m., at the Springville Road Regional Branch Library. 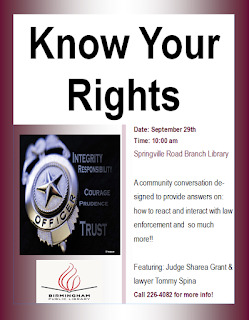 Jefferson County District Judge Shera Grant and Birmingham lawyer Tommy Spina will be the guest speakers. The workshop is free and open to the public. The workshop is designed to spark a community conversation designed to provide answers on how to react and interact with law enforcement, said Lutheria Jackson, a library assistant who is coordinating the program. Jackson said she came up with the idea for Know Your Rights in the wake of hearing of many incidents across the country in which people have been fatally shot after encountering police. A Birmingham school is bringing several teenagers to the program in an effort to educate young people, Jackson said. Organizers are hoping the conversation will help build better relationships between public citizens and law enforcement. For more details on this workshop, call Jackson at the Springville Road Library at 2052-226-4082. You know the feeling you get after finishing a book? Sometimes hopeful, mostly empty. What if I told you that you can get that same feeling but only after six words? And this time, the stories are about food, so the empty feeling will be felt in your stomach and not your heart. The Birmingham Public Library is hosting a contest that will do just that. 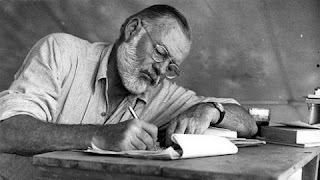 “For sale: baby shoes, never worn.” The iconic story supposedly written by Ernest Hemingway made the six-word story challenge more well-known across the country. 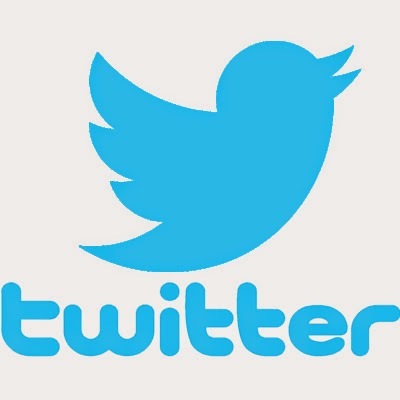 Today, there are websites and even Twitter accounts dedicated to sharing the emotion-packed tales. As part of the Birmingham Public Library (BPL)’s annual Eat Drink Read Write festival, BPL is hosting a six-word story contest on the subject of food. Let out the story of your best (or worst) Thanksgiving dinner, your favorite local dish. Submissions will be judged on creativity and originality. You must be an Alabama resident. Submission must be in English and exactly six-words long. Birmingham Public Library staff and immediate family members are ineligible. Two winners, 1st and 2nd place, will receive a $25 gift card to Babalu Tacos and Tapas plus a copy of Not Quite What I Was Planning: Six-Word Memoirs by Writers Famous and Obscure by Rachel Fershleiser and Larry Smith. The deadline to submit is Saturday, October 1, at 11:59 p.m. Winners will be announced on Friday, October 7, 2016. The commands, and then the entreaties of his uncle and guardian, were alike in vain. All the kindly arguments of friends and relations were answered in a spirit equally kind; but his determination was unshaken. “You are not well enough to leave your room,” urged his physician. “I will be to-morrow,” was the reply. He did leave it. By a mere effort of will he shook of disease as a loose garment and, enfeebled and emaciated as he was, went forth to brave hardships and dangers from which the stoutest frame and the boldest heart might have shrunk without disgrace. The more I studied it, the more I became convinced that the world never presented such a combination . . . of daring courage and vile malignity, of high aspirings and low hypocrisy. Shrewd, artful, and unscrupulous, there were no means he might not employ to accomplish his ends . . .
Face to face in the presence of the God who must pronounce our several dooms, I shall say that he deserved the death he received at my hands; and never, for one moment, has a thought of repentance obtruded itself upon my soul! 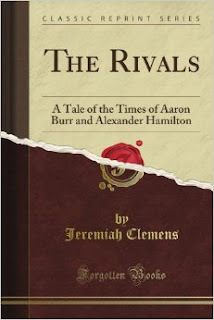 The Rivals is an interesting historical artifact of a time when the duel between Burr and Hamilton was within living memory, not some dry page out of a history book. The event took place on July 11, 1804 and Clemens was born in 1814; in his boyhood the duel would have been a part of the immediate past and he admits in the foreword of The Rivals that he had entertained “strong prejudices” against Hamilton from the time he was young. At this time when Alexander Hamilton is enjoying a period of unprecedented glamour in the public eye, a pro-Burr document is a fascinating counterbalance. Our copy of The Rivals is housed in Southern History’s Rare Book collection. Come and visit us if you would like to view it, or if you can’t come for a visit, there are numerous online sources available. What are your thoughts on the Burr and Hamilton conflict? The Birmingham Public Library (BPL)’s 19 locations are a haven for many students across the city who come in after school to wait on their parents. Two city libraries—Smithfield Branch Library and Springville Road Regional Branch Library—have begun new programs designed to help students boost their grades and study skills. The Smithfield Library is offering free homework tutoring help for elementary- to high school-age students on Tuesdays and Thursdays between 3:30 and 4:30 p.m. The program, Power Hour: Making Minutes Count, is being offered through November 22 to students who register in advance at the Smithfield Library. The afterschool tutoring service began last week, said Heather McWilliams, Smithfield Library branch manager. “This is more of a homework help session than a class. It's ongoing and it's every Tuesday and Thursday from 3:30-4:30,” McWilliams said. The Springville Road Library has also started a new afterschool program designed to help Birmingham area students improve their grades. 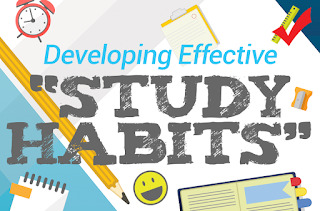 The program, Study Skills and Listening Skills Classes, will meet again on Wednesday, September 28, at 4:30 p.m. “Get the school year started the right way with education consultant Ursula Bradley. 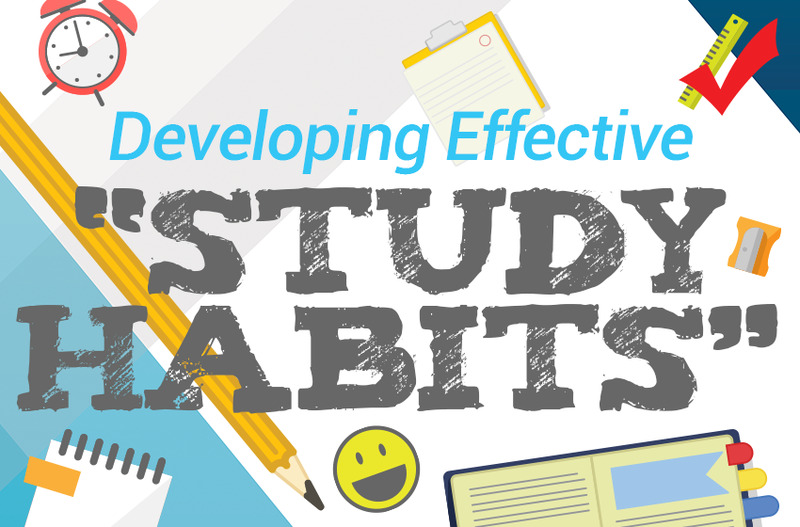 She will speak to students about essential study skills and listening skills.” To sign up, call Springville Road Library at 205-226-4085. If you have an antique book or historic map in need of mending in metro Birmingham, Paul Boncella of the Birmingham Public Library (BPL) is a guy you need to know. 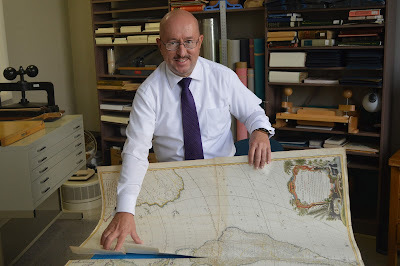 Since October 2012, the former concert organist has been fixing old maps and books as map conservator and book mender in the Southern History Department in the Linn-Henley Research Building, Central Library. He occasionally does this work as a favor to patrons, but many of them are unaware of the fascinating jobs Boncella did in his previous career that allowed him to showcase his musical talents across the globe. Prior to joining BPL, Boncella spent 13 years as a concert organist, including performances in the former West Germany, and as a church organist. He also published musicological studies in several publications, presenting his research at conferences in Australia, Canada, England, Scotland, Spain, and throughout the U.S. Boncella also served as an instructor of music at Johns Hopkins University in Baltimore while pursuing his graduate degree there, and at Rutgers University in New Jersey while pursuing his doctorate in musicology. He also taught music in Alabama community colleges for 12 years before joining BPL. “My work as a musician and a musicologist prepared me for my current job,” said Boncella, who also says his hobby of genealogy also led him to join BPL. Title: Map conservator and book mender in the Southern History Department, Linn-Henley Research Library. College: BM and MM in organ performance from Johns Hopkins University; MA, MPhil, and PhD in musicology from Rutgers University. How long with BPL: Four years. What you do: Prepare antique maps for digitization, storage, and study; repair and rebuild books in the Tutwiler Collection; provide genealogy reference assistance to patrons; develop and teach genealogy classes. 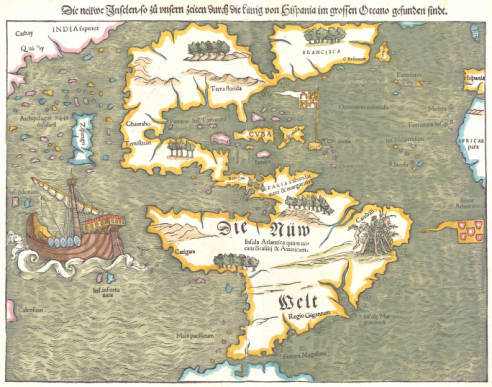 Favorite part of your job: Map conservation affords me the privilege of handling beautiful, valuable maps that date as far back as the 1500s, and it gives me the satisfaction of knowing that I have put them on the path to surviving for centuries to come. Favorite movie: Dune (David Lynch, 1984). Favorite Television Show: Anything with Jacques Pepin in it. How to reach Paul: Office: 205-226-3663; Southern History Department: 205-226-3665; or visit him at the Southern History Department. Anyone researching their family tree knows that DNA is the hottest trend in genealogy. Genetic genealogy can often break down brick walls or confirm suspicions that you found in your research. One of the most difficult things to do is African American and Native American genealogical research. DNA does provide clues, but there is no magic in genetic genealogy and no special tests for African American and Native American research. However, you can make choices that will make DNA testing an invaluable tool in your research. Our final Beyond the Basics of Genealogy workshop is Genetic Genealogy Strategies for African American and Native American Research. It will be held in the Arrington Auditorium on Saturday, October 1, 10:00-11:30 a.m. Workshops are free of charge, but registration is requested. To register, contact the Southern History Department of the Birmingham Public Library at 205-226-3665 or askgenlocal@bham.lib.al.us. Registration is now open for staff and the public for the October 2016 class schedule. During this month, we include a variety of classes including Basic PC, Excel 2010 Basic, and Hiring Process for Jefferson County. All classes are held in the Regional Library Computer Center (RLCC) of the Central (downtown) Library. PRE-REGISTRATION IS REQUIRED FOR ALL CLASSES. To register for any class, please email us at cenrtc@bham.lib.al.us or call 205-226-3681. 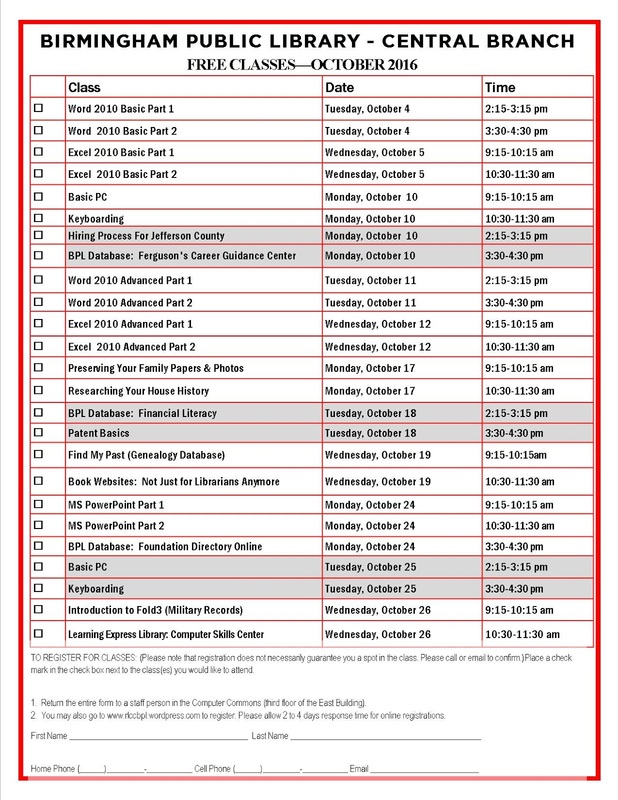 You may also download and print a pdf copy of the October 2016 class scheduleto bring to a Computer Commons staff member on your next library visit. 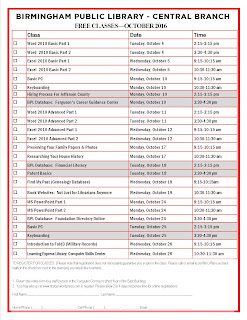 Please note that the October 2016 class schedule pdf can be sent to us as an email attachment. Thanks to a $50,000 grant from the UAB Benevolent Fund, the Birmingham Public Library (BPL)’s Teens Engineer Birmingham (TEB) afterschool program has expanded from the Central Library to two additional branch libraries this fall. In mid-September, the Woodlawn Branch Library began offering TEB for students from nearby Woodlawn High School on Mondays at 3:30 p.m. On Tuesdays at 3:30 p.m., the Southside Branch Library is now hosting TEB for students from nearby Ramsay High School. The Central Library has added more activities for participants of its TEB afterschool program, held on Wednesdays at 3:30 p.m. and comprised mostly of students from nearby Phillips Academy. BPL purchased 3D printers and other engineering equipment to expand the program after being chosen as recipient in February of $50,000 from the UAB Benevolent Fund, a grant program funded by UAB employees. Lance Simpson, system teen librarian for BPL, and Carrie Campbell, now working in the Arts, Literature and Sports Department and formerly grants and special projects librarian, submitted the grant application on behalf of BPL. 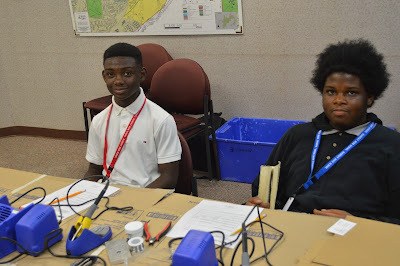 The UAB School of Engineering has partnered with BPL’s Central Library since 2015, coordinating the engineering program offered for school children in Birmingham, including Phillips Academy. Dr. Abi Yildirim, director of outreach for UAB’s School of Engineering, and UAB student mentors work with the teens participating in all three BPL engineering programs. Lisa Higginbotham, UAB Benevolent Fund program manager, said in a statement last December that UAB is honored to support the BPL Teens Engineer Birmingham program. I cannot be happier that college football is back. We are in Week 3 and rankings have been moving around like pieces on a chess board. The first week of the season is always very exciting because I can’t wait to see if teams live up to the preseason hype and hang on to their rankings. Good recruiting classes and healthy returning starters are important, but you never know what’s going to happen until the teams take the field. Several games during Week 1 changed the football landscape. It was no surprise that top-ranked Alabama defeated #20 USC down in Texas, but the score was quite a surprise (52-6). I expected a top-25 team to put up better numbers and so did the Associated Press. USC dropped out of the top 25. Tennessee entered the season at #9 but needed overtime to beat Appalachian State (20-13). They dropped to #17 but their Week 2 win over Virginia Tech (45-24) elevated them to #15. Houston entered the season at #15, but the show they put on at home defeating #3 Oklahoma (33-23) elevated them all the way to #6. Oklahoma dropped down to #14. One of the best opening week games, in my opinion, was #10 Notre Dame vs. Texas. Texas has a history of great quarterbacks (e.g. Vince Young, Colt McCoy) and their true-freshman gunslinger, Shane Buechele, is no exception. He had two touchdown passes and one rushing touchdown in his first college game. The teams battled through double overtime with Texas pulling out the win (50-47). As a result, Texas went from unranked to #11. Notre Dame dropped to #18. 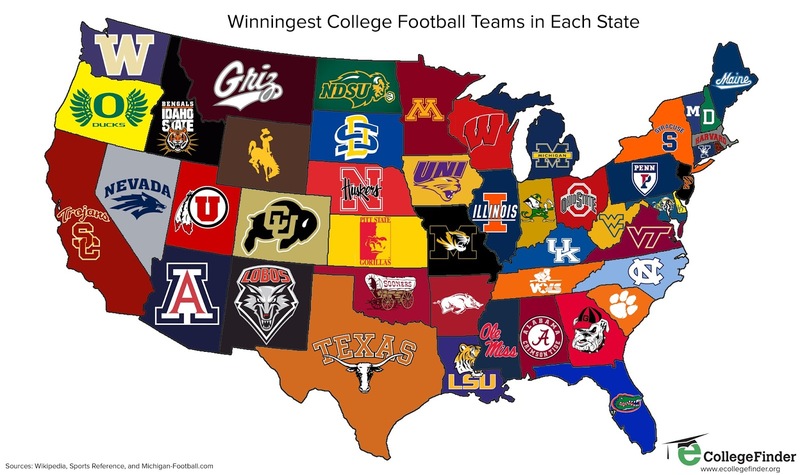 I was excited to see LSU ranked at #5 to begin the season because college football is more fun to me when several SEC teams are expected to have a strong season. Unfortunately, they lost to an unranked Wisconsin team (16-14) which dropped them down to #21. They moved up one spot to #20 after their Week 2 victory over Jacksonville State (34-13). Wisconsin landed at #10 after the victory and gained an additional spot (#9) after their Week 2 victory over Akron (54-10). It's a long season, though, and you can never sleep on LSU. I hope you are enjoying the first few weeks of college football season. I expect a lot of great games and plenty of shuffling in the AP Top 25. If we can get some cooler weather to go along with all this football, that would be perfect. Enjoy the season! 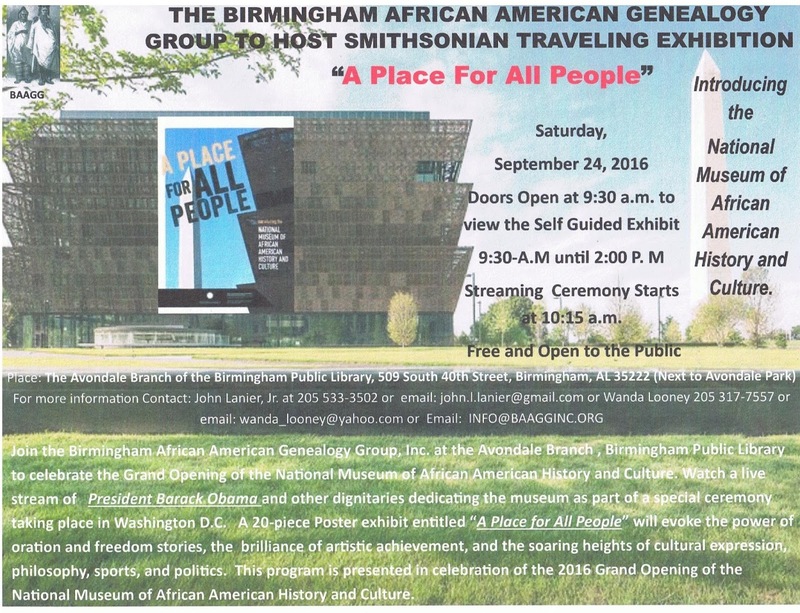 Join the Birmingham African American Genealogy Group, Inc., Saturday, September 24, 9:30 a.m.-2:00 p.m., at the Avondale Regional Branch Library to celebrate the grand opening of the National Museum of African American History and Culture, the Smithsonian Institution’s newest museum. Watch a live stream of President Barack Obama and other dignitaries dedicating the museum as part of a special ceremony taking place in Washington D.C beginning at 10:15 a.m. In addition to the stream viewing celebration, a self-guided tour of the 20-piece poster exhibit A Place for All People that was produced jointly by the Smithsonian Traveling Exhibition Service (SITES) and the National Museum of African American History and Culture will be on display. A Place for All People will evoke the power of oration and freedom stories, the brilliance of artistic achievement, and the soaring heights of cultural expression, philosophy, sports, and politics. In addition to profiling the long struggle to create the museum, the building’s architectural design and its prominent location on the National Mall, the poster exhibit is a survey of the African American community’s powerful, deep, and lasting contributions to the American story. 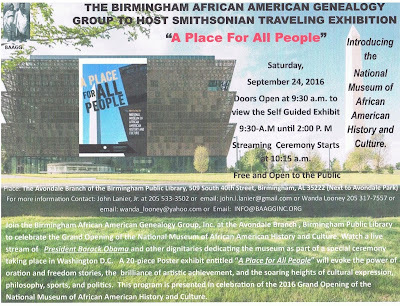 This program is presented in celebration of the 2016 grand opening of the National Museum of African American History and Culture. For more information, please e-mail Wanda Looney of Birmingham African African Genealogy Group at wanda_looney@yahoo.com. Sherlock Holmes and Professor Moriarty have seemingly fallen to their deaths at the Reichenbach Falls. In the aftermath, two avid followers of Dr. Watson’s accounts, American Pinkerton agent Frederick Chase and Inspector Athelney Jones of Scotland Yard, have come to Switzerland to confirm events and view Moriarty’s corpse. Chase is hoping to find a clue to the identity of secretive criminal mastermind Clarence Devereaux, an American who may have been collaborating with Moriarty to bring vicious New York crime to England. Soon enough Inspector Jones reveals a keen analytical mind, reminding Chase of Holmes himself and the two of them are on their way to London in pursuit of the elusive Devereaux. Chase feels like Watson to Jones’ Holmes. 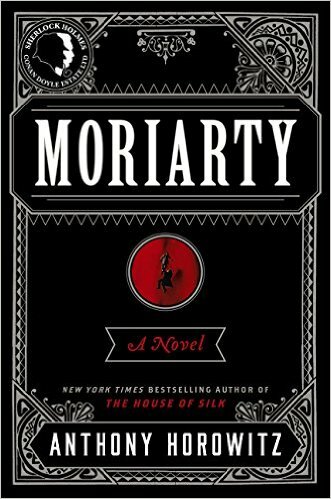 Moriarty is clearly a book for Holmes aficionados. The places and the characterization evoke the sensibility of Doyle himself. The narrative unfolds with the same inevitability, but something feels wrong. Is Holmes really dead? Moriarty? Is this all a fantasy blooming in the mind of an inspector obsessed with the Holmes legend? As we read to uncover the secret hiding beneath the surface, we are led into the very belly of voracious London, and the narrative approaches the edge of horror. Nonetheless Pinkerton agent Chase and Inspector Jones remain interesting and sympathetic characters. We very much hope they survive their case. The twist, when it unexpectedly arrives, like that of any great detective story, causes us to rethink everything we thought we had carefully read. 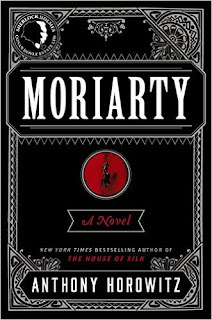 Moriarty is Anthony Horowitz’s second Sherlock Holmes novel. It follows The House of Silk, published in 2011. A popular mystery writer, he was chosen by the Ian Fleming estate to write a Bond novel, Trigger Mortis. He also wrote the Gatekeepers series for young adults. Storytellers at the Five Points West Regional Branch Library will soon have a huge machine producing lots of bubbles to keep kids entertained while listening to stories. At the Avondale Regional Branch Library in October, four new art programs will expose children to various artistic styles. And at the East Ensley Branch Library, wooden planks called KEVA (Knowledge, Exploration, Visual, Arts) will be used to allow kids to use creative exploration to erect structures such as buildings and bridges. The three awards, presented during the September 13, 2016, BPL Board Of Trustees meeting, are the latest recipients of the Birmingham Public Library's (BPL) Innovative and Cool Award, a program set up earlier this year to encourage library staff to come up with unique ideas to serve their communities. Five Points West Library, Bubbles at Storytime – storytime with a twist: bubbles to keep kids entertained as books are being read to them. Avondale Library, Art Attack – four art programs during October designed to expose children to different artistic styles including modern color block painting, American folk art, and Aboriginal dot painting. Participants will get canvas artwork to take home. East Ensley Library, KEVA (Knowledge, Exploration, Visual, Arts) Planks – KEVA planks are thin rectangular blocks that can be used to erect structures such as buildings, bridges, and formations. This program will allow patrons an interactive experience for creative exploration and cooperative learning. 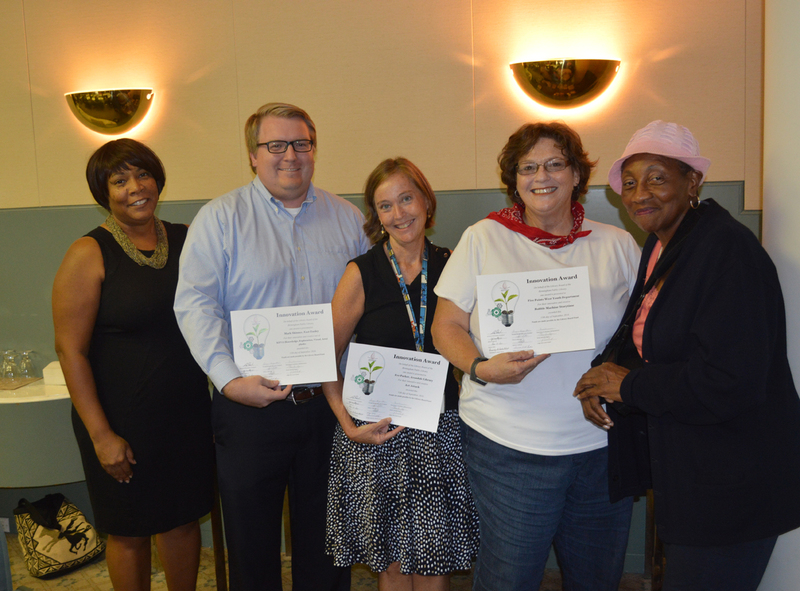 “The board is proud of employees’ participation in the Innovative and Cool Award initiative. We look forward to the display to showcase all programs that engage patrons of all ages," said Dora Sims, chair of the BPL Advocacy Committee. 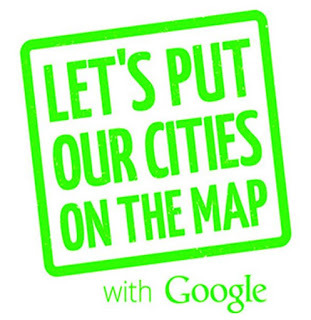 The Birmingham Public Library and the city’s Office of Economic Development are partnering with Google and Zeekee, a local Internet marketing firm, to offer a workshop aimed at helping put every business in Birmingham on the map—including yours—for free. For your convenience, two sessions of the workshop will held on September 28. The same information will be covered in each session, so you only need to attend one. Times: 9:30-11:00 a.m. or 12:00-1:30 p.m. 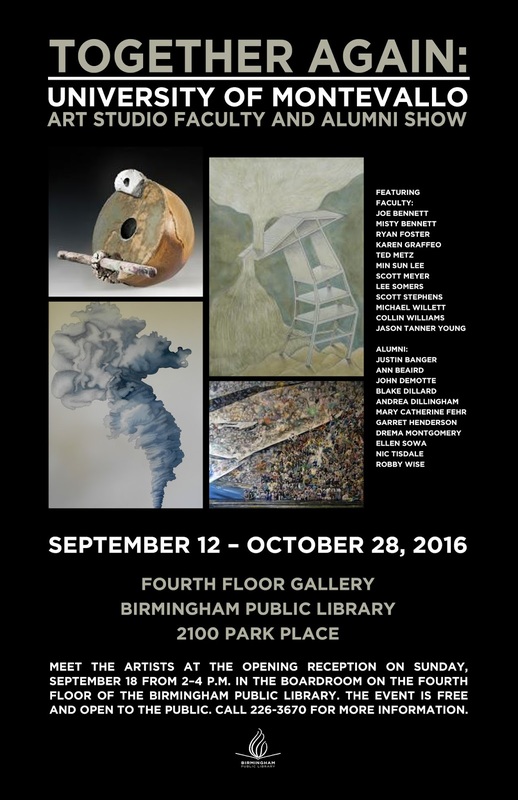 The Birmingham Public Library (BPL) has begun hosting a free public exhibit of recent work by University of Montevallo (UM) Department of Art faculty and its graduates. 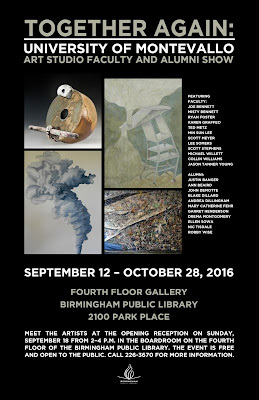 The exhibit, Together Again: University of Montevallo Art Faculty and Alumni Show, opened September 12 and will be on view for the public through October 28, 2016, in the Central Library's Fourth Floor Gallery. An opening reception will be held on Sunday, September 18, 2016, 2:00-4:00 p.m.
Art is big at Montevallo and the Department of Art is one of the largest departments in the university. With a dedicated full-time faculty of 13 and over 250 art majors, students experience the challenges and have the resources to achieve the highest artistic level. Many choose to continue their education in graduate programs across the country. The Birmingham Public Library (BPL)’s Southern History Department has resumed teaching hands-on computer genealogy classes with Ancestry.com this September, and is debuting its Fold3 class. The department also will be making genealogy presentations at libraries in Irondale and Homewood in coming weeks. See details on Southern History upcoming workshops below. You can also find out more about Birmingham Public Library free workshops and classes by clicking on the calendar listings at www.bplonline.org. Want to learn how to do genealogical research? Come to this introductory class that will help get you started on your genealogical journey. The first location is the first floor of the Linn-Henley Research Library in the Southern History Department and will include a tour of the department. The second location is the Homewood Public Library, room 101 on the lower level. This is the first session in the Genealogy 101 series the Southern History Department will be doing at Homewood Library over the next several months. Wednesday, September 21, 9:15-10:15 a.m. Participants will be introduced to the Ancestry.com Library Edition database in which you can research your family history as well as learn how to search this database to locate your ancestors. This class will be held in the computer lab, 4th floor, Linn-Henley Research Library, and space is limited. To register, please call 205-226-3680. Wednesday, September 28, 9:15-10:15 a.m. There is no magic in genetic genealogy and no special tests for African American and Native American research, but there are choices you can make that may enable you to confirm and to go beyond the evidence of the paper trail. Workshops are free of charge, but registration is requested. To register, contact the Southern History Department of the Birmingham Public Library at 205-226-3665 or e-mail askgenlocal@bham.lib.al.us. After hearing 12-year-old Percy's and 10-year-old Mykel’s career goals during the program, Whittaker gave them information on various occupations fitting their interests. In coming weeks, she will advise workshop attendees on real-life situations such as how to budget for bills, groceries, and vacations based on their income. 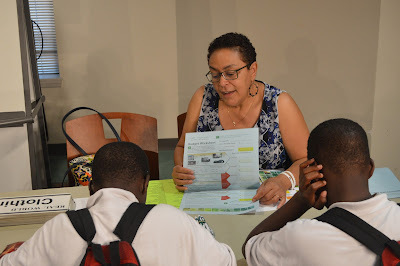 “Career Countdown is geared towards young people, and my goal is to help guide them on how to determine career interests and develop a plan that will promote readiness for employment possibilities,” said Whittaker, an urban regional extension agent. 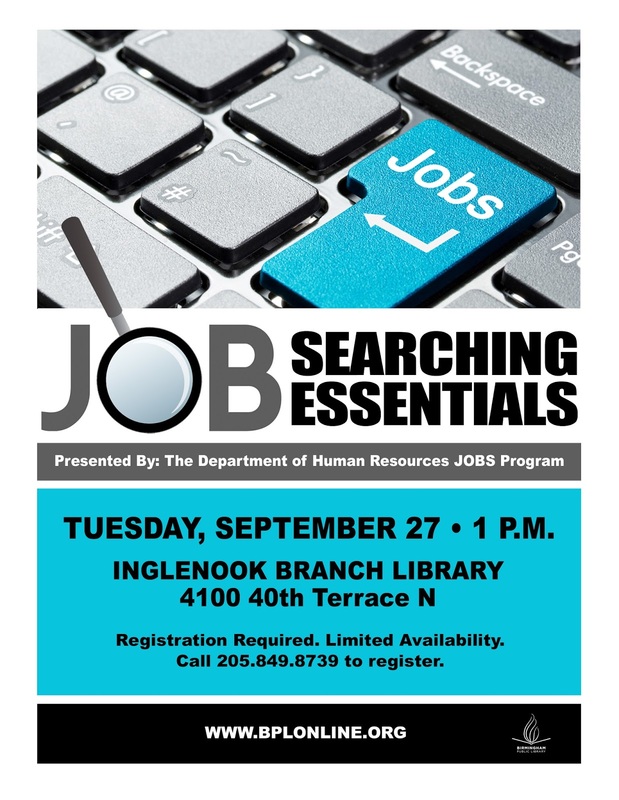 If you are looking for a job or desire a better job, mark your calendars for several job seeker workshops and classes taking place at BPL during the month of September. You can find out about more programs offered at BPL at www.birmingham365.org. Central Library, September 12, 2:15-3:15 p.m.
Central Library, September 12, 3:30-4:30 p.m.
West End Library, September 14 and 21, 3:30 p.m.
Inglenook Branch Library, September 27, 1:00 p.m.
A Decatur woman has donated to the Birmingham Public Library (BPL) 19 copies of an acclaimed documentary DVD and five copies of its companion book that promotes a vegan lifestyle. People who are vegan don’t consume or use any animal products or by-products. 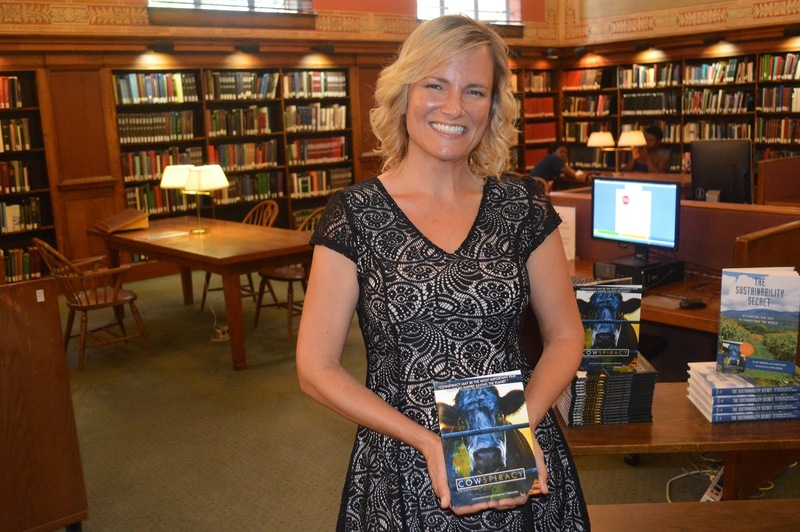 Jennifer “Auntie Jen” Roberts donated copies of Cowspiracy: The Sustainability Secret to each of BPL’s 19 branches. Roberts also donated five copies of the film’s companion book, The Sustainability Secret, to the following BPL locations: Central, Springville Road, North Birmingham, Five Points West, and Avondale. Roberts acquired copies of Cowspiracy after meeting co-director Keegan Kuhn while attending the NYC Green Festival in April 2016. She had learned of the documentary, which has gained a loyal following in the global vegan community since its June 2014 release, by following actor Leonardo DiCaprio’s Facebook page, which is dedicated to inspiring the public to take action on key environmental issues. DiCaprio is executive producer for the film. Cowspiracy is a groundbreaking feature-length documentary that examines animal agriculture's impact on the environment and investigates why some of the world's leading environmental organizations are too afraid to talk about it. The film has appeared on Netflix, available for streaming courtesy of DiCaprio's company, Appian Way Productions. “Mr. DiCaprio is one of my role models, and my dream is to work for the Leonardo DiCaprio Foundation (LDF),” said Roberts, a vegan and lifelong advocate for human rights, wildlife, domestic animal welfare, and the environment. LDF focuses on protecting wildlife, saving our oceans, restoring wildlands and empowering communities. Roberts said she donated the DVDs and books to educate the public about the health benefits of a vegan lifestyle and the negative impact of animal agriculture on the environment. She also has donated five copies of the DVD and five copies of the book to the Huntsville-Madison County Public Library, and next week will donate a copy of the film and book to the Decatur Public Library. Read an article about Cowspiracy and watch the trailer below. 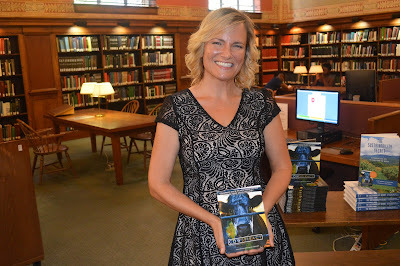 Roberts said she was inspired to donate the Cowspiracy DVDs to BPL after reading about Birmingham-based nonprofit Black Warrior Riverkeeper and Southern Environmental Law Center donating to BPL 57 DVDs—2013, 2014, and 2015 editions of the film Southern Exposure. The public can get more background on the DVD at the Southern Exposure website. Roberts was so inspired by the award-winning Cowspiracy and her talks with the documentary co-director that she has come on board as one of the associate producers of What the Health, an upcoming feature-length documentary from the creators of Cowspiracy. What the Health is being dubbed ‘the health film that health organizations don’t want you to see,'” Roberts said. Here is a link to the official film trailer www.whatthehealthfilm.com. Your resume may be the most important single document you have in determining success in your professional life. Although your resume does not insure that you will be hired for a job, the quality of the resume will have a major effect on whether or not you land an interview for a job. A strong resume leads to more interviews, and more interviews will eventually take you to the job that best suits your interests and needs. Conversely, a flawed resume can lead to you being ignored, rejected, and ultimately kept from getting the job of your dreams. But knowing the importance of a good resume is one thing, actually developing and creating one is quite another. Unfortunately, as the saying goes, a resume does not write itself. If you think you could benefit from having some assistance in getting your resume together, then plan on attending the Job Readiness Resume Clinic being held at the Central Library on Friday, September 9, 2016. This free event is brought to you by the New Rising Star Community Support Corporation, a local nonprofit organization dedicated to serving the community by providing programs aimed at promoting education, workforce development, housing opportunities, senior citizen care, and healthy lifestyles. Representatives from New Rising Star will be on hand at the clinic to provide one-on-one advice on crafting both the content and format of your resume. The goal will be for all attendees to walk away from the clinic with an actual completed resume in hand. For more information about the clinic and other career resources available at the Birmingham Public Library, please contact Jim Murray of the Central Library’s Business, Science and Technology Department by e-mail at jmurray@bham.lib.al.us or by calling 205-226-3690. The Job Readiness Resume Clinic will be the first of a series of Connect4 Careers workforce development events sponsored by New Rising Star in September that include a Career Coaching Clinic on Saturday, September 17 and a Job Fair on Saturday, September 24. For further information about these events, please check the New Rising Star website at http://www.nrscommunity.org/jobfair. 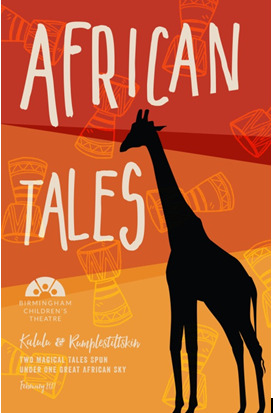 The Birmingham Public Library (BPL), in partnership with the Birmingham Children’s Theatre (BCT) and the Junior League of Birmingham (JLB), would like to invite you to attend From Page to Stage: African Tales – A Readers’ Theater Workshop for Children. In anticipation of the upcoming BCT performance of African Tales, BPL will be hosting free workshops at several of its area libraries. Children ages 5 to 12 will learn how stories come alive through the magic of theater. JLB members will coach the children and introduce them to similar literature located in their local library. Each child will receive two free tickets (one child and one adult ticket) to the BCT African Tales production in October 2016. The fire crackles, the drums pulse, and everyone listens to two tales magically spun under the great African sky. In Rumpelstilskin, a young queen's love for her child thwarts the evil intentions of a crooked little man. In Kalulu, a swaggering and boastful hare suffers the consequences of deceit when he tries to swindle a bag of gold from the king. The characters in these two legends create a whirlwind of color and sound, and evoke the magic of triumph of good over evil. Saturday, September 17, 2:30 p.m.
Sunday, September 18, 2:30 p.m.
Saturday, September 24, 2:30 p.m.
A WW2 fighter pilot crashes to his death, but he doesn’t die. It’s not that he’s lucky; the Afterlife personnel messed up. While the pilot (David Niven) wanders unharmed around England, the bureaucrats in the Afterlife find the man who blew it and get him to go down to Earth to straighten things out. But things get complicated when Niven’s character falls in love. Now he doesn’t want to die even if he should. He has to plead his case for staying on Earth in the Great Beyond, which looks like a super sleek forties British government office, all clean-lined Art Moderne. Keyword is look; the functioning is not so efficient, as we’ve seen. This is the only film I’ve seen where Niven doesn’t play a parody of an upper class Englishman, a slot he’d long since occupied when I first saw him in the sixties. It was an agreeable change of pace to see him as a conventional dramatic actor, and he does an endearing job of it. Special effects are so vital when you have to portray, in addition to the Beyond itself, the various things like time manipulation the Beyond bureaucrats do in order to fix their mistakes. And they look stunning here, not embarrassing in the way that dated things of this sort tend to. It’s elegant to a fault. The effects seem to foretell those employed in Jean Cocteau’s Orpheus, another cinematic magical tale that came out four years later. Maybe A Matter influenced the latter movie. Note: this movie is also known as Stairway To Heaven. Another note: this movie is coupled with another Powell-directed film in the 2-DVD set: Age Of Consent, starring a young and already precociously talented Helen Mirren in her first lead role. Now, more than ever, people need free access to accurate and current information. 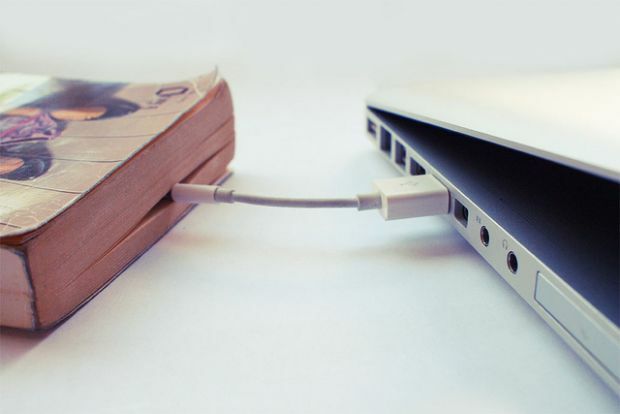 In order to provide it, libraries have changed the way that information is delivered. Through our website, we provide 24/7 reference, as well as information on classes, events, and programs. The Internet is a fabulous tool, but there are no laws, rules, regulations, or policies to ensure the accuracy, currency, or quality of what's posted. It's possible to find information you can trust, but it can be hit or miss. Your library staff is trained to help you find exactly what you need, when you need it. We've got links to trusted websites and to subscription databases that are free to library card holders. Most of these links are available from any Internet terminal, although a few (such as Ancestry Library Edition) can only be accessed within a library. If you've ever Googled a broad topic and gotten millions of responses, you may appreciate knowing how to conduct a Deep Web search. If you'll pair a broad search term with the type of information you need and where it might be found, and link them with a + sign, you'll narrow your search to save time and effort. For instance, try doing a search for "Battle of Lexington." When I did this on Google, I got 1,090,000 results. When I did a search on "Battle of Lexington + primary sources + archives," I got 406,000 results. If I wanted to research this battle, I would be much more likely to find relevant and accurate information with the second search without wading through websites trying to sell me something! When you need the best information available, ask a librarian or view our website. Both are available to help you find what you need. We have books and e-books; audiobooks on CD and as downloadables; and computer/Internet access with printing. 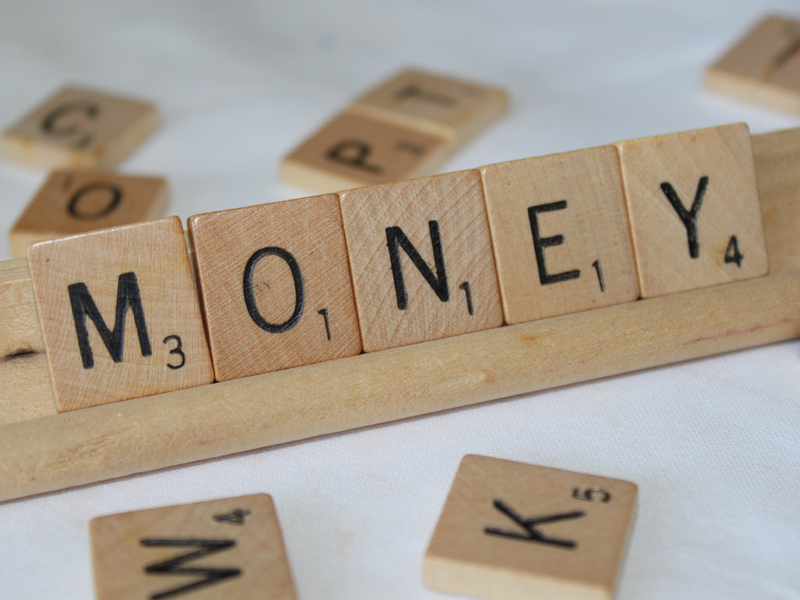 Programs support education, entertainment, and economic goals. Wireless hotspots, both in the building and circulating, are available. As technology has changed, so have we! The Birmingham Public Library's motto is "Preserving the Past, Exploring the Future." We are dedicated to using 21st century technologies to build, maintain, and deliver materials and services how and when our patrons need them. If you haven't been in a library for awhile, drop by your local branch. You may be surprised at what's available and how we provide it without "throwing the baby out with the bath water." We still have what folks have loved about libraries for decades, but we've changed to make sure it's available when and how our members most need it. 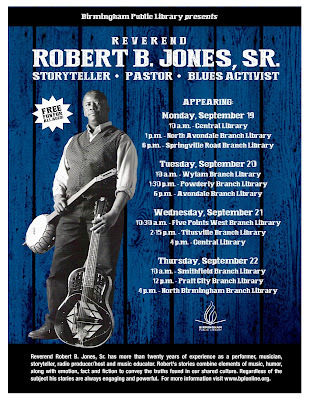 Reverend Robert B. Jones, Sr. will be bringing his 20+ years of music, humor, and storytelling to selected Birmingham Public Library (BPL) locations. Jones was born in Detroit, Michigan, in 1956, but grew up in a Southern-influenced household: his father was from West Pointe, Mississippi, and his mother from Conecuh County, Alabama. His grandmother's record collection exposed him to all types of music when he was growing up, especially the blues. Jones's act combines storytelling, vocals, instrumental music, and artwork to explore the earliest known aspects of African American culture to showcase the music and stories that came before the blues. 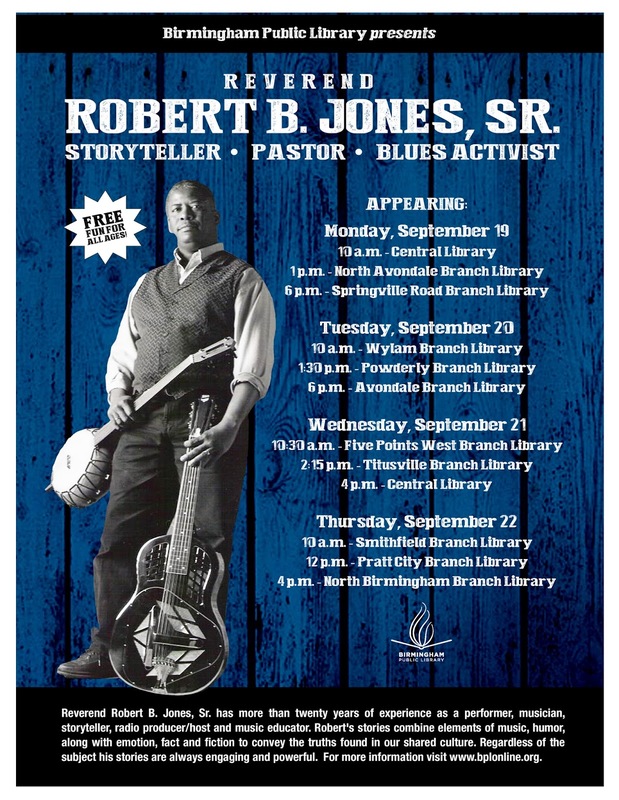 For more information on Robert B. Jones, visit his website at http://www.revrobertjones.com/. North Avondale Branch Library, 1:00 p.m.
Springville Road Regional Branch Library, 6:00 p.m.
Wylam Branch Library, 10:00 a.m.
Powderly Branch Library, 1:30 p.m.
Avondale Regional Branch Library, 6:30 p.m.
Five Points West Regional Branch Library, 10:30 a.m.
Titusville Branch Library, 2:15 p.m.
Smithfield Branch Library, 10:00 a.m.
Pratt City Branch Library, 12:00 p.m.
North Birmingham Regional Branch Library, 4:00 p.m.
Visit http://www.bplonline.org/locations/ for information on BPL locations. The Smithfield Branch Library has a new branch manager. 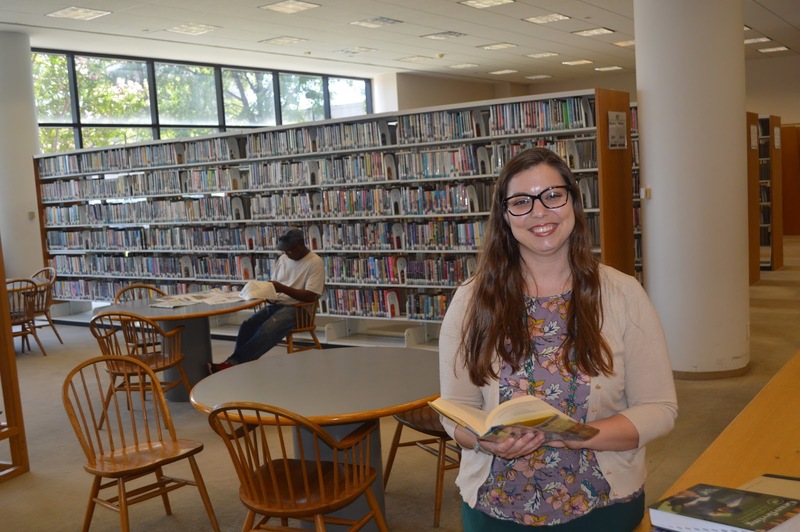 Heather McWilliams, 29, began overseeing the library on August 22, 2016. Before joining the Birmingham Public Library (BPL), McWilliams served as head librarian the past two years at the Helen Keller Public Library in Tuscumbia, Alabama, the oldest chartered public library in Alabama. A Tuscaloosa native, McWilliams attended undergraduate and graduate school at the University of Alabama, where she obtained a master of library science degree in 2011. 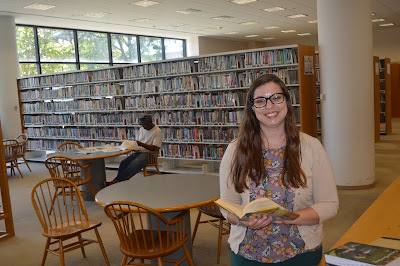 Upon graduation, McWilliams worked at Bevill State Community College as a librarian before moving to work at the Rose Creek Public Library in Woodstock, Georgia, where she discovered a passion for working at a public library. Playing with your baby is not only important for bonding, but it is also an educational experience for your child. We are providing a special time and place for you to come to the public library and spend one-on-one time playing with your child. This five-week program involves children from birth through age three and their parents or caregivers. The library will have age appropriate toys, books, and art activities just for you and your child. Also, we have invited special guests from the community to join us each week to answer your questions about parenting. September 7-October 5, 2016 – every Wednesday at 10:00 a.m.
September 6-October 4, 2016 – every Tuesday at 10:00 a.m.
October 6-November 10, 2016 – every Thursday except Oct. 20 at 10:00 a.m.
October 11-November 8, 2016 – every Tuesday at 10:00 a.m.
October 12-November 9, 2016 – every Wednesday at 10:00 a.m. If you need a new library card or owe money on overdue books, DVDs, and other items, September is the time to take advantage of two special library promotions available in Birmingham and all of Jefferson County. The Birmingham Public Library (BPL) is a member of the Public Libraries in Jefferson County (PLJC), which is hosting its seventh annual Food for Fines and September Library Card Swap. The Food for Fines program begins Thursday, September 1, 2016, and lasts until September 30, 2016, in conjunction with PLJC's September library card campaign. Patrons who owe fines will have $1 in fines waived for each food item donated, up to a maximum of $10 per patron. The amount waived must apply to fines only (not replacement costs). The food drive is open to anyone, even if they do not have overdue materials. “Our goal is to encourage users to return overdue materials while also giving back to our communities,” said Patricia Ryan, executive director of the Public Libraries in Jefferson County. The effort comes at a time when area food banks and pantries are running low on donations. BPL and PLJC hope this campaign will be the boost several nonprofit food organizations need as they approach the fall holidays. The 40 public libraries in Birmingham and elsewhere in Jefferson County plan to donate goods to nonprofit food banks including United Way Food Bank, Magic City Harvest, and Greater Urban Ministries. Individual libraries may also donate the items to a local church or charity of their choice. Over 21,000 cans/items were collected for area food banks each of the last two years. There must be a legible expiration date visible on the can or box, and all items must be donated before the expiration date in order to be accepted. BPL and PLJC can accept boxed and canned foods. Food for Fines is held in conjunction with the annual National Library Card Sign-Up Month in September, in which cardholders can trade in their old wallet library card for a keychain library card or get the old one replaced for a new library card at no charge, with the usual $3 replacement fee waived. Under the library card swap program, patrons can print out a coupon allowing them to see fees waived for a replacement card. The coupon is available at this link: http://intranet.jclc.org/sharedresources/SeptSwap2016.pdf. The Birmingham Public Library and the Alys Stephens Center are pleased to present the lecture Spanish Treasure: Maps from the Era of Exploration on Tuesday, September 13, 2016, as part of Hispanic Heritage Month. Join us at 6:00 p.m. in the Library’s Arrington Auditorium for a fun and exciting program which will portray Spanish exploration and growth in the New World, as recorded on maps. It will highlight the tremendous effect that Spain had on the development of the region, and the lasting heritage in much of the Western Hemisphere. Drawing from the library’s world class collection of 16th and 17th century maps, map librarian George Stewart will take attendees back in time by showing them some of the earliest and most significant maps to come out of the Spanish expeditions to the New World. Early maps were not only important navigational tools, but they are also incredibly detailed works of art. Many of the maps are elaborately decorated and include such eye-catching details as sea monsters, native flora and fauna, and beautiful inscriptions. After the presentation, time will be available to view the original maps. Many of the library’s most treasured maps were donated by Rucker Agee, a lifelong map collector and enthusiast. The library has also benefited from the donations of fellow collectors John C. Henley, III, James Woodward, and Dr. Charles Ochs. Thanks to their generosity, the Birmingham Public Library houses a truly extraordinary map collection. "Don't judge a book by its cover" is a saying to evaluate something on its content rather than its outward appearance. However, we often judge a book by its cover to determine if it's worth reading, and many of our greatest classics still wear poorly designed or auto-generated covers that fail to capture what makes these books exciting and inspiring. Recovering the Classics is a crowdsourced collection of original covers for classic books in the public domain created by illustrators, typographers, and designers of all stripes. Its partners include the Creative Action Network, Harvard Book Store, Plympton's DailyLit, the White House, the New York Public Library, and the Digital Public Library of America. The goal is to bring an exhibit of redesigned cover posters to each of the 50 states, and the Birmingham Public Library (BPL) is representing the state of Alabama. The Central Library will have the main exhibit of Recovering the Classics posters, and other BPL branches will have smaller exhibits. BPL has partnered with Books-A-Million to host a contest for Alabama artists of all ages and abilities to design a cover for a classic book. Prizes include your cover design on a classic book created by Books-A-Million's Espresso Book Machine, Books-A-Million gift cards, and Recovering the Classics posters. To enter the contest, visit www.bplonline.org/classics. Both the exhibit and contest will run September 1-30, 2016. If you are looking for a job or you desire a better job, mark your calendars for several job seeker workshops and classes taking place at the Birmingham Public Library (BPL) during the month of September. Friday, September 9, 2016, 10:00 a.m.-2:00 p.m. Your resume may be the most important single document you have in determining success in your professional life. Although your resume does not insure that you will be hired for a job, the quality of the resume will have a major effect on whether or not you land an interview for a job. A strong resume leads to more interviews and can land you a job, while a flawed resume can lead to you being ignored and rejected from getting the job of your dreams. This is free event being coordinated by the New Rising Star Community Support Corporation (NRS), a local nonprofit organization dedicated to serving the community by providing programs aimed at promoting education, workforce development, housing opportunities, senior citizen care, and healthy lifestyles. Representatives from NRS will be on hand at the clinic to provide one-on-one advice on crafting both the content and format of your resume. The goal will be for all attendees to walk away from the clinic with an actual completed resume in hand. The Job Readiness Resume Clinic will be the first of a series of Connect4 Careers workforce development events sponsored by NRS in September that includes a Career Coaching Clinic on Saturday, September 17, and a Job Fair on Saturday, September 24. For further information about these events, please check the NRS website at http://www.nrscommunity.org/jobfair. For more information about the clinic, and other career resources available at BPL, please contact Jim Murray of the Central Library’s Business, Science and Technology Department by e-mail at jmurray@bham.lib.al.us or by calling 205-226-3690. Monday, September 12, 2:15-3:15 p.m.
Staff members from the Jefferson County Human Resources Department will explain the process of getting hired for Jefferson County jobs. Information will also be provided on how to master pre-employment tests including the oral interviews used by Jefferson County as well as other types of employment tests. Monday, September 12, 3:30 -4:30 p.m.
Business, Science and Technology staff will show how to make the most of the library's Career Cruising database. Career Cruising features career guidance information, a directory of schools, financial aid information, a job search guide, skills assessment tools, and a variety of employment resources. 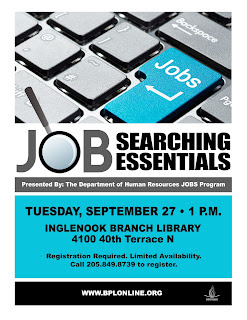 This workshop will give job seekers information that can boost their job search and lead to employment. Space is limited and advance registration is required at 205-849-8739.